In a few short weeks, Mike Reilly will take the mic on the Big Island and shout those four magical words to thousands of athletes coming across the finish line. This year marks the 40th running of the sufferfest known as the Ironman World Championships in Kailua-Kona, Hawaii. This is the pinnacle of long-course triathlon, not only for the professionals, but also for the age-group participants who are fortunate enough to qualify (and pay) for this legendary event. I have heard non-triathletes say “Look at me, there is no way I could do that!” or my peers talk incessantly about hitting “race weight”. 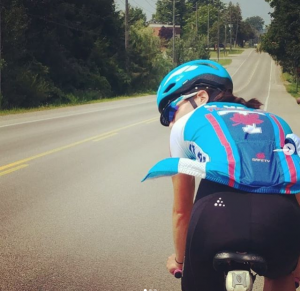 Even professional triathlete and the pride of Windsor Lionel Sanders has admitted to being too obsessed about getting lean, which might have contributed to his fading performance at Ironman Mont Tremblant. This begs the question – how much does body composition impact your performance in these ultra-long distance events? An article published by the Journal of Strength and Conditioning Research in 2010 examined the correlation between body composition, training volume, and performance in amateur racers competing in Ironman Zurich. This study used a few different measures for body composition, including but not limited to body mass, percent body fat, and Body Mass Index (BMI). The investigators also requested weekly training logs for the three months leading up to Ironman Zurich. Once the race was complete, the data from 27 male and 16 female triathletes were used. Did the results scream leaner is better, or train more to gain more? It was actually very muddled, likely due to the small sample size and lack of detail when it comes to their training quality. If you are a man, the lower your percent body fat, the faster you raced. However, your time spent training had little impact on your finishing time. This could be reflective of the fact that intensity of training was not quantified in their data collection. You can often get away with fewer total training miles if you up the intensity of your workout. If you are a woman, the story is flipped. Percent body fat was not a great indicator of finishing time, however, the more you trained, the better the results. Other studies have shown a similar relation between training volume and finishing times in women. This article basically ended more like an episode of LOST (anyone remember that show? ); way more questions than answers. But let’s bring it back to the original question – is body composition a good indicator of performance? At the end of the day decreasing your body fat is a good thing, with the worst case scenario being that it might have no impact on your finishing time, which is ok! There are plenty of other health benefits that come hand in hand with managing your body composition. The key though is to do so in a healthy manner that doesn’t leave you depleted. Consider getting a DEXA scan at The Armoury to get hard numbers of your body composition. Follow that up with a consultation with our naturopath Dr. Aaron Samanta ND and our great team at the Armoury to get you going to a leaner, meaner you! 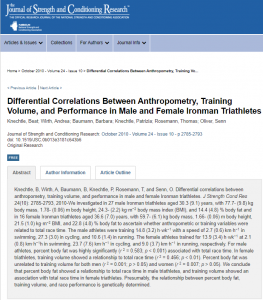 Reference: Differential Correlations Between Anthropometry, Training Volume, and Performance in Male and Female Ironman Triathletes, Journal of Strength and Conditioning Research, 2010.